Imagine smart materials that can morph from being stiff as wood to as soft as a sponge — and also change shape. 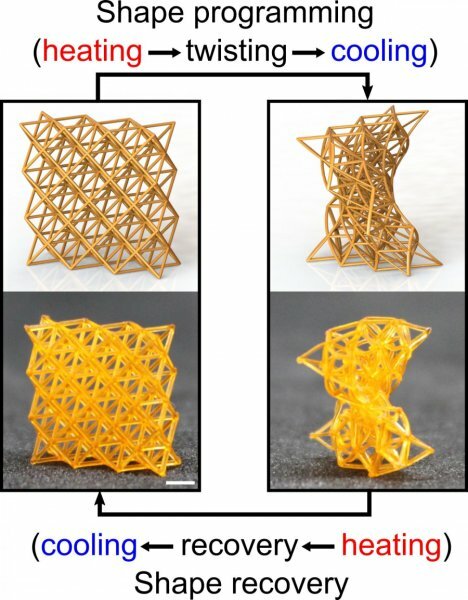 Rutgers University-New Brunswick engineers have created flexible, lightweight materials with 4D printing that could lead to better shock absorption, morphing airplane or drone wings, soft robotics and tiny implantable biomedical devices. Their research is published in the journal Materials Horizons. « We believe this unprecedented interplay of materials science, mechanics and 3D printing will create a new pathway to a wide range of exciting applications that will improve technology, health, safety and quality of life, » Lee said.